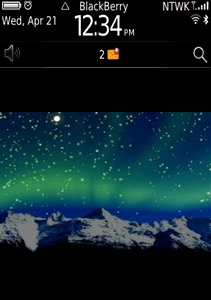 The Aurora Borealis Live Wallpaper is simply amazing. Watch as the Northern Lights shimmer in the night sky creating the most beautiful effect. * Live motion wallpaper for the BlackBerry Torch and Bold 9780 available for other models shortly. * Only functions in portrait mode on the BlackBerry Torch landscape mode will show a still image. NOTE: For best results you should perform a hard reset by removing the battery for a few seconds after the installation. To activate or change any wallpaper, go to: Options, Display, Screen Display, press your chosen wallpaper theme and then press Activate. We have partnered with Bernie Lee Designs and are now able to add your photos to the following customized designs: spinning photo cubes, slideshows, and event based images. We can also add personalized text to our existing 3D images and logo designs for stunning effects. Please leave us positive feedback if you like our live wallpaper. However, if you are not satisfied for any reason, please contact us first using the support e-mail link before leaving feedback so that we may assist you in a resolution. Thank you and we hope you enjoy our Live Wallpaper.